Government Publications, Maps, Microforms & Newspapers (GMM) is comprised of three major collections that serve UW faculty, students, staff, and researchers from the local community and around the world. 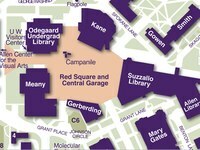 GMM is located on the ground floor of the Suzzallo Library. Visit GMM for in-person help with finding and using materials in the collections. The space also offers viewing and scanning equipment for microforms, maps, and government documents, a station for charging your devices, and tables for single and group study.